The basic unit of structure in SQL is called a table because it’s usually displayed in a tabular format. HTML5 also has a table structure, which is ideal for outputting SQL data. 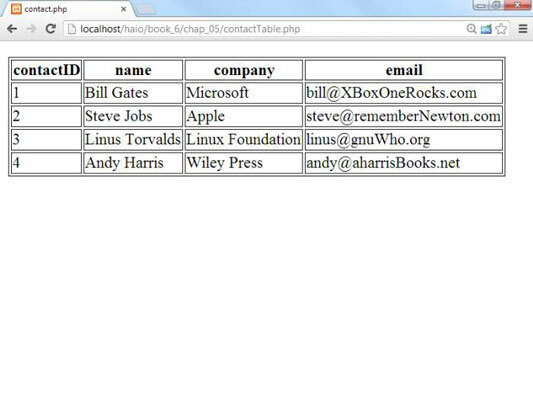 ContactTable.php, displays the contact information inside an HTML table. You might be confused that a table is being used here. Tables aren’t evil: They just aren’t designed to be a page layout mechanism. Tables, however, are designed to display tabular data, and the result of a data query is pretty much the definition of tabular data. You can (and should) still use CSS for specific layout details of the table. Tables are fine when used to present data. Build a normal MySQL connection. Begin with the standard connection. Don’t worry about formatting until you’re reasonably certain that you can read data from the database. Print the table tag before extracting any results. All the query data will be displayed inside the table, so print the table tag before you start printing anything that should go inside the table. Make a first pass to extract field names. You’re actually going to query the database twice. The first time, you simply want the field names, which you’ll use to build the table headers, so it only needs one row. The fetch method pulls the next available record from the $result variable. You want the record data in associative array format, so pass the PDO::FETCH_ASSOC constant to indicate this. Print the field names as table headers. Now that you have a single record, walk through that record as an associative array and use the $field values to print out field names. Now execute the query again with the $con->query() method. This time, you’re doing an ordinary query with multiple results. Don’t forget to set the fetch mode to associative array. Use nested loops to print out data elements. Use the ordinary nested-loops trick to print out all of the data elements with each record taking up one row of the HTML table.